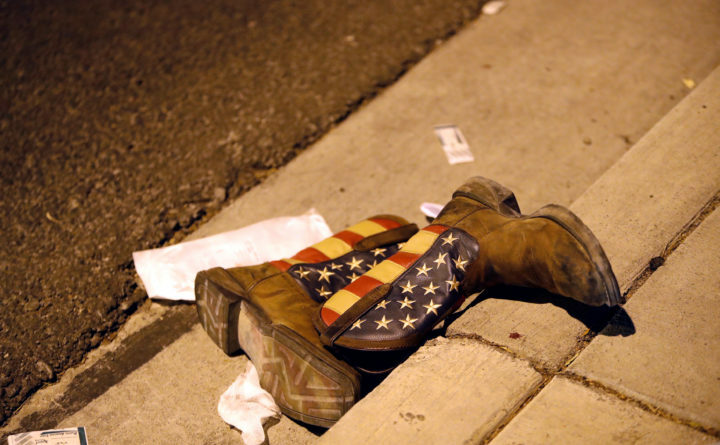 A pair of cowboy boots is shown in the street outside the concert venue after a mass shooting at a music festival on the Las Vegas Strip in Las Vegas, Nevada, U.S. Oct. 1, 2017. Las Vegas police and emergency vehicles sit on scene following a deadly shooting at a music festival on the Las Vegas Strip early Monday, Oct. 2, 2017. Drapes billow out of broken windows at the Mandalay Bay resort and casino Monday, Oct. 2, 2017, on the Las Vegas Strip following a deadly shooting at a music festival in Las Vegas. A gunman was found dead inside a hotel room. 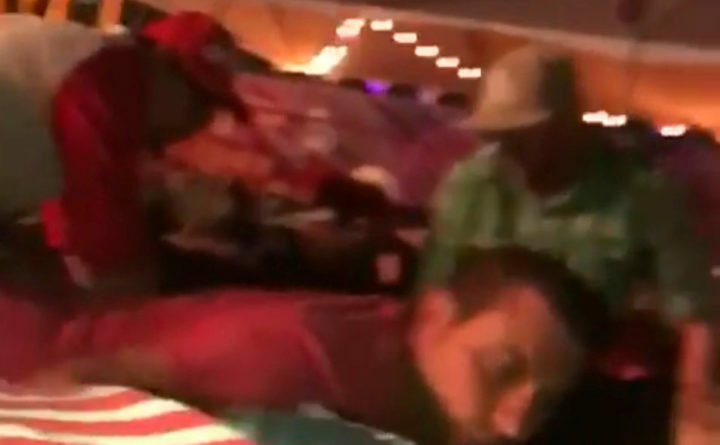 People attending the Route 91 Harvest Music Festival, crouch down as a gunman opens fire from the 32nd floor of a hotel, in Las Vegas, U.S., Oct. 1, 2017 in this still image obtained from social media video. A woman sits on a curb at the scene of a shooting outside a music festival along the Las Vegas Strip, Monday, Oct. 2, 2017, in Las Vegas. Multiple victims were brought to hospitals after a shooting late Sunday at a music festival on the Las Vegas Strip. The grounds are shown at the Route 91 Harvest festival, with the Mandalay Bay Hotel behind the stage, on Las Vegas Boulevard South in Las Vegas, Nevada, U.S. Sept. 30, 2017. 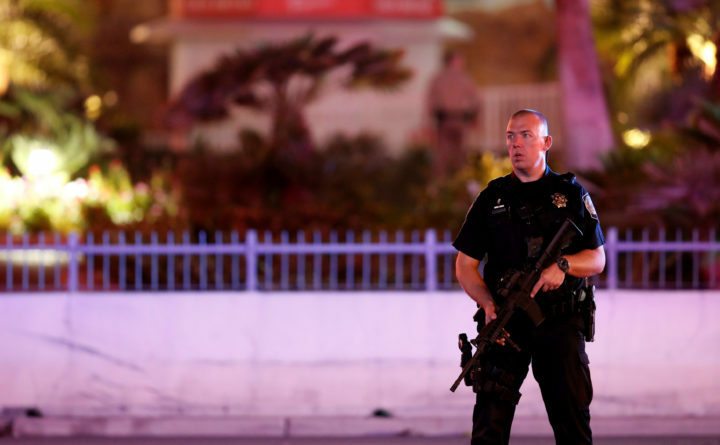 A law enforcement officer stands in front of the Tropicana hotel-casino on Las Vegas Boulevard South on Oct. 2, 2017, after a mass shooting during a music festival in Las Vegas, Nevada, U.S.
Las Vegas police respond during an active shooter situation on the Las Vegas Strip near Tropicana Avenue in Las Vegas Sunday, Oct. 1, 2017. 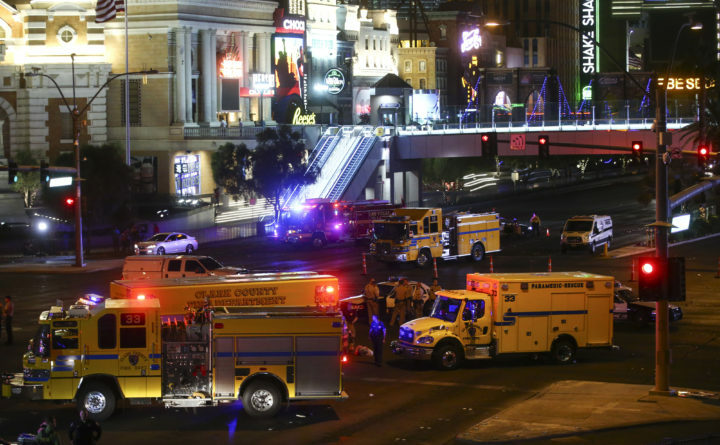 Multiple victims were being transported to hospitals after a shooting late Sunday at a music festival on the Las Vegas Strip. Las Vegas Metro Police and medical workers stage in the intersection of Tropicana Avenue and Las Vegas Boulevard South after a mass shooting at a music festival on the Las Vegas Strip in Las Vegas, Nevada, U.S. Oct. 1, 2017. 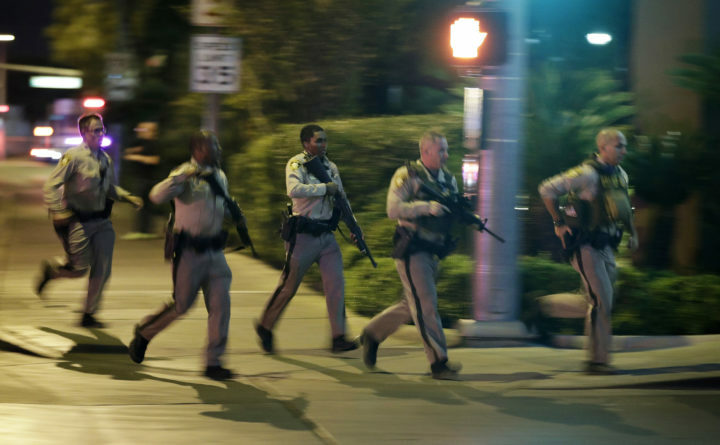 Police run to cover at the scene of a shooting near the Mandalay Bay resort and casino on the Las Vegas Strip, Sunday, Oct. 1, 2017, in Las Vegas. Multiple victims were being transported to hospitals after a shooting late Sunday at a music festival on the Las Vegas Strip. 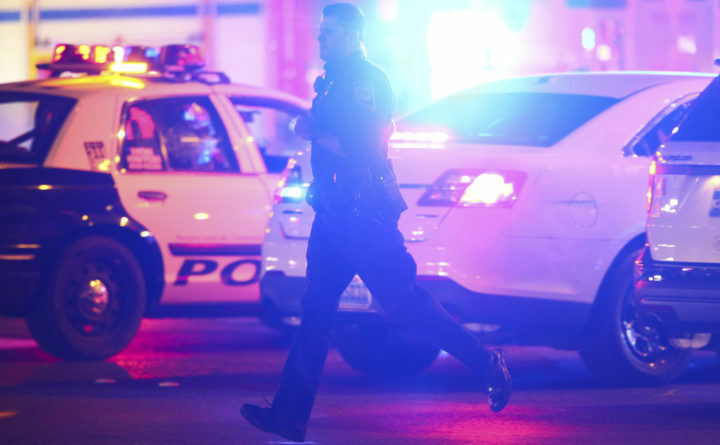 Thousands fled the hail of gunfire in Las Vegas. These people stayed to try to save lives. 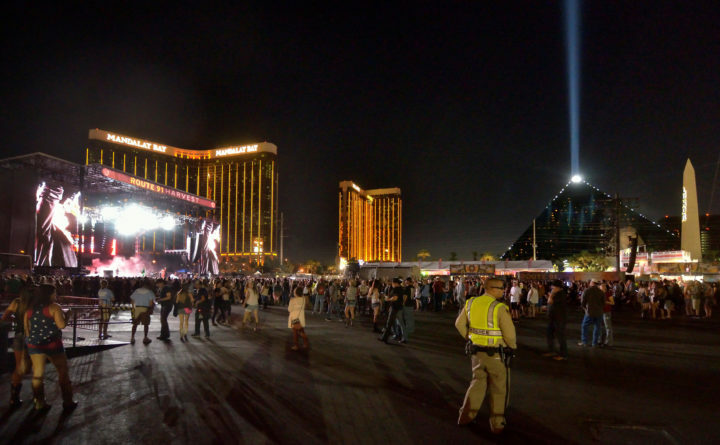 LAS VEGAS — The rapid-fire popping sounded like firecrackers at first, and many in the crowd of 22,000 country music fans didn’t understand what was happening when the band stopped playing and singer Jason Aldean bolted off the stage. Then the bang-bang-bang sounds resumed. And pure terror set in. 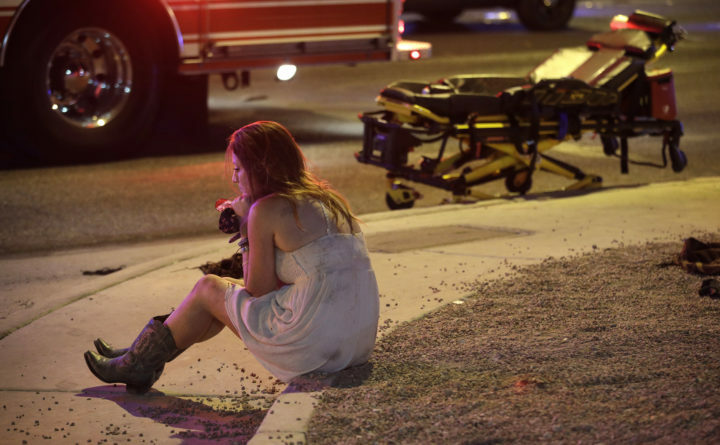 By Monday afternoon, 59 people were dead and 527 wounded in the deadliest mass shooting in modern U.S. history. 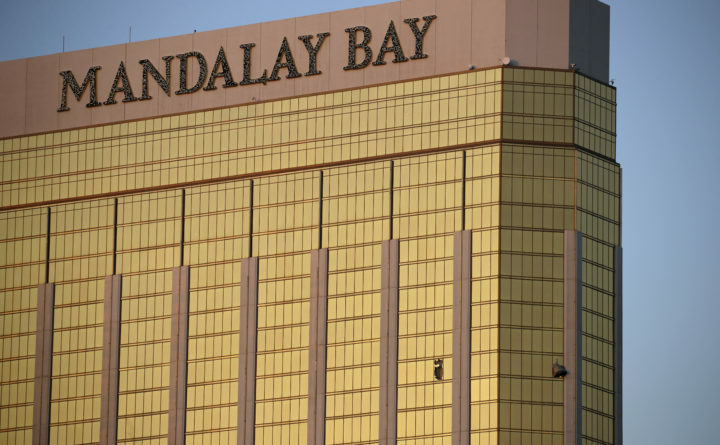 The gunman, identified as Stephen Craig Paddock, a 64-year-old retiree from Mesquite, Nev., killed himself before officers stormed Room 135 in the gold-colored glass skyscraper. He had been staying there since Thursday and had busted out windows to create his sniper’s perch. 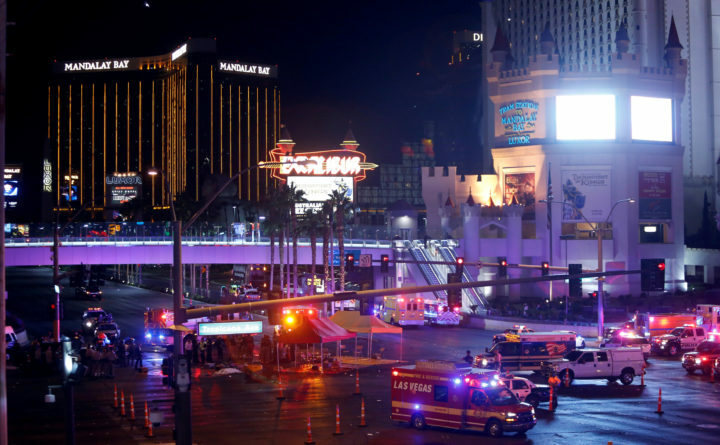 Paddock had 17 guns with him, including two that were modified to make them fully automatic, according to two U.S. officials briefed by law enforcement who spoke on the condition of anonymity because the investigation is still unfolding. At his home, authorities found an additional 18 guns, explosives and thousands of rounds of ammunition. In an address to the country, President Donald Trump called the bloodbath “an act of pure evil” and added, “In moments of tragedy and horror, America comes together as one. And it always has.” He ordered flags flown at half-staff. The shooting began at 10:08 p.m. Sunday, and the gunman appeared to fire unhindered for more than 10 minutes, according to radio traffic. Police frantically tried to locate him and determine whether the gunfire was coming from Mandalay Bay or the neighboring Luxor hotel. He wasn’t finished with the first verse when he abruptly stopped singing and hustled off the stage. Paddock apparently used a hammer-like device to smash out windows in his room and open fire. Muzzle flashes could be seen in the dark. The crowd, funneled tightly into a wide-open space, had little cover and no easy way to escape. Victims fell to the ground while others fled in panic. Some hid behind concession stands. Others crawled under parked cars. Some of the injured were hit by shrapnel. Others were trampled.